Gango Editions is pleased to offer a large selection of bird prints. 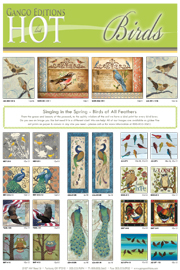 From the grace and beauty of a peacock, to the quirky wisdom of the owl, we have a bird print for every bird lover. Do you see an image you like but need it in a different size? We can help! All of our images are available as giclee fine art prints on paper & canvas in any size you need – please call us for more information at 800-852-3662. You can download our new Bird Hot List here .